Horror games should make you feel scared. 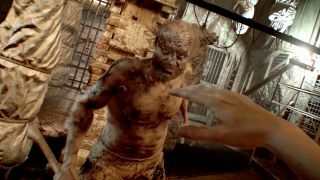 And Resident Evil 7 does ‘scared’ very well. I jumped a lot, flat out screamed a few times and, when playing in VR, flailed uselessly at the air under my chin as a mutilated, regenerating corpse lifted me up by the neck. That bit was horrible. And it was all brilliant. After the clomping, camp action of the last few instalments it’s a genuine pleasure to say Resident Evil has returned to the bloodstained walls and don’t-open-them doors of its roots. Although where the original game took inspiration mainly from George A. Romero’s zombie movies, this cribs from a far wider palette. Films like Texas Chainsaw Massacre and The Hills Have Eyes inspire the main villains, the Baker family; building scares, before members of the clan take turns to mount plodding pursuits with all the persistence of a Jason Voorhees or Michael Myers. To a lesser extent, movies like Hostel and the later Saws play a part in inspiring its violence and death. And, finally, it all plays out in the decrepit, peeling, mildewy house from your nightmares - made from grimy, gore encrusted corners full of things that’ll never wash out. The Bakers are clearly… not alright. Something’s infected them. They’re haggard and veiny pale, full of crazy talk and near ecclesiastical fervour. They’re also trying to force feed me the guts by prying my teeth open with a hunting knife. The metal on enamel rattling is about as bad as you can imagine. As introductions go, the message is clear: ‘help, I’m trapped in a house with crazy people who like knives’. Good. Great. However, after the doorbell rings and the family scatter I manage to escape and the game reveals its core loop: avoiding the Bakers and solving puzzles to open doors. What’s really interesting is just how quickly this all feels like a classic Resi game. It might be in first person but it’s not long before you’re looking for bull emblems and dog headed badges to open doors. Then there’s the save rooms. They’re back again, this time with game-saving tape players replacing typewriters, but otherwise the item-storing crates and soothing music are just as you remember them. Nothing feels more like a Resi game than finding one of these safe havens, hearing its warbling tune and realising you don’t have to worry, for at least a few minutes. You can literally feel your entire body unclench. The fear and the pressure that makes those safe rooms such a relief comes initially from the Baker family. Soon after escaping you find yourself trapped in a small section of the house with Jack stamping about trying to find you. With the hero now essentially a mute vessel for you, Capcom has intentionally made the enemies much more of a focus for characterisation. Jack (and later Marguerite) call out to you as they hunt you down, they curse you, promise horrible things if they catch you, and just generally make hiding a much more stressful experience. Hiding is for the best, though, and combat is largely to be avoided. While you can acquire a range of pistols, shotguns, a knife and even a jerry-rigged flamethrower - apparently made out of hairspray and a bike handlebar - they’re more delaying tactics than anything else. The Bakers might go down but they tend to keep getting back up, making complete avoidance of them the best way to go. Get seen and it leads to a messy, panicky trading of blows as you try to buy time to run away. These sections are paced well - you might have to avoid Jack or Marguerite (and, presumably, the son Lucas and a creepy old grandma in a wheelchair later) while collecting things you need for a puzzle, then find yourself alone for a little while to explore. It teases out threat, calm and the building dread of things being too quiet beautifully from what I’ve played. No one section ever overstays its welcome. There are also more scripted encounters that work like boss fights and make good use of their first person constraints. I won’t spoil too much but one takes place in a garage with a couple of interesting mechanics I’ve not seen before. Another happens in a ruined house and plays like the worst game of hide and seek you’ve ever had. The Bakers aren’t the only threat wandering around, and another tonal element comes from the Molded, Resi 7’s signature ‘monster.’ While the Bakers pursue and chase, these attack and ambush. Notes around the Baker Mansion hint at some sort of fungus being responsible this game’s infection. The Molded are almost human, but formed from glistening black mycelial strands that can fall from growths coating the walls everywhere. That adds an element of unpredictability and extra tension to their appearance. They’re also hard to kill, creating that most classic of Resi conflicts: run or fight. Ammo’s not exactly in every drawer you open so, like the zombies of old, getting into a tussle isn’t always something you want rush into. What I’ve played so far has been encouragingly strong, to the point where this could easily stand alone without the Resident Evil name as a great horror game. The fact that it still can with that name attached (and its connotations of a melon-biceped Chris Redfield fighting bone dinosaurs) probably says more. The four or five hours I’ve seen has actually been one of the best things I’ve played this year, riffing the series’ familiar values off the uncertainty of its newer ideas to create something unpredictable and, above all else, interesting.